Characteristic odour in the vicinity of the mouth and nose, and in the gastric contents. · Characteristic odour in the vicinity of the mouth and nose, and in the gastric contents. · Congestion of GI tract. · Pulmonary and cerebral oedema. · Stigmata of chronic alcoholism may be present (fatty or cirrhotic liver, cardiomyopathy, and characteristic lesions in other organs). o Apart from the routine viscera and body fluids, one half of brain (or one cerebral hemisphere), as well as samples of CSF and vitreous humor should be collected and preserved for chemical analysis. o Blood should always be collected from a peripheral vein such as femoral vein and never directly from the heart. Caution must be exercised in interpreting the results of chemical analysis conducted on putrefying dead bodies since postmortem production of ethanol occurs in such cases due to the action of certain micro- organisms. This can result in a BAC of upto 20 to 30 mg/100 ml even when no alcohol had been consumed at all prior to death. Similar erroneous results may be obtained (in the case of a non-putrefied body) in a blood sample that has not been properly preserved. In all such cases the urine should be mandatorily tested, and if no alcohol is detected it can be safely presumed that the BAC is false due to postmortem production. In the absence of a urine sample, bacteriological examination of blood should be carried out before interpreting the results of chemical analysis. This formula however cannot always predict the BAC accurately, and is more useful in corroborating rather than predicting BAC. The use or abuse of ethanol is associated frequently with medicolegal implications and consequences. Alcohol abuse is prevalent worldwide. Efforts have been made to totally prohibit alcohol consumption in different countries without much success (with the possible exception of those countries where religious law is in force). Such attempts uaually lead to illicit brewing and consumption with even more serious consequences. At present in India, total prohibition is in force only in Gujarat. Efforts to implement the same in Tamilnadu, Andhra Pradesh, and Haryana met with dismal failure. All over India (except Gujarat where prohibition is in force), the mere consumption of alcohol and consequent drunken behaviour in themselves do not constitute any offence. Only when the drunken individual behaves in such a manner as to become a public nuisance, or poses a threat, or actually commits an act endangering the life or property of another person (or even his own), will the law take cognisance of the fact. · A doctor is sometimes called upon by the police to examine an individual who has been taken into custody for creating public annoyance in a state of intoxica-tion, or for driving a vehicle under the influence of alcohol, or for being involved in a criminal offence after drinking. · In such a case, the doctor must exercise great caution before coming to a conclusion. He must first be familiar with the exact meaning of the term ‘drunkenness”. An individual can be certified to be drunk only when there is evidence that “he was so much under the influence of alcohol as to have lost control of his faculties to such an extent as to render him unable to execute safely the occupation in which he was engaged at the material time”. The essence of this definition is that the doctor must search for evidence indicating that the individual concerned was under the influence of alcohol. The smell of ethanol in the breath, the pulse rate, dilatation of pupils, colour of the face, etc., give no indication of the degree of intoxication. Conclusion regarding this must be arrived at after a detailed examination with special reference to the state of mind, co-ordination of movements, visual acuity, etc. · As in every medicolegal case, before embarking on the physical examination of the individual, the doctor must first obtain his written consent. This must be tempered by the fact that if an individual really is drunk then he is probably in no fit medical condition to give or refuse consent. In such cases, the doctor can proceed with the examination but should not divulge the results or his conclusions until the individual has sobered up and provides valid consent. However, if there is an explicit direction from a judicial court to divulge the results without delay, the doctor must comply with such direction. If an individual refuses consent and is unco-operative, the doctor can proceed with the examination without bothering about this formality if the former has been arrested for a criminal offence and is under the custody of the police (S. 53 (1), CrPC). But the requisition in such a case should have been issued by a police officer not below the rank of a Sub-Inspector. The doctor can conduct not only the physical examination of the accused, but can even collect samples of urine or blood for analysis. · Sometimes the question is asked (when it is proved that a person had consumed alcohol), as to how much he could have drunk, i.e. the quantity of liquor consumed. To answer this question, two facts must be known: the BAC, and the nature of alcoholic beverage taken. If these are known an estimate can be made as to the minimum quantity of liquor consumed by consulting Table 14.6. A rule of thumb is that every ounce of an800 proof liquor will raise the BAC by 25 mg% (i.e. one peg of distilled spirit, or one glass of wine, or a quarter to half bottle of beer). Average elimination rate is 15 to 20 mg% per hour. As an alternative or supplement to BAC, the level of alcohol can also be estimated in the urine (UAC). · To calculate the BAC from the UAC, multiply the latter by 0.66 which gives a rough estimate. For example, if the UAC is 100 mg%, the BAC would be 100 × 0.66 = 66 mg%. It is to be noted however that the first sample of urine voided after the individual was taken into custody by the police must not be used for analysis since there is a likelihood of erroneous interpretation. The urine sample will contain very low concentration of alcohol even after heavy drinking if the person had started consuming alcohol when his bladder was already containing urine. On the other hand, a very high concen-tration will be obtained if he had emptied his bladder and then commenced drinking heavily. Therefore the person should be asked to empty his bladder and then a second sample is collected after some time which is used for analysis. · Brawls, assaults (sexual and non-sexual), homicides, and suicides are commonly associated with intoxica-tion. Even if the assailant was so drunk that he had lost total control over his mental faculties and therefore was not in a position to judge whether his actions were right or wrong, he is still punish-able for any criminal act committed by him (S. 86, IPC), unless the alcohol was administered to him without his knowledge or against his will (S. 85, IPC). –– BAC upto 50 mg%—driving ability of most indi-viduals is unaffected, though there may be slight impairment in some individuals. –– BAC 50 to 100 mg%—most people are affected to varying degree. –– BAC 100 to 200 mg%—there is severe impairment of driving ability with increased liability to accident. –– BAC over 200 mg%—there is a high likelihood of an accident. Driving a vehicle on a public thoroughfare under the influence of alcohol (or any other intoxicating drug) is an offence in almost every country of the world. In India, it is an offence punishable under Section 185 of the Motor Vehicle Act (1988, Amended 1994) in the form of a fine which can extend upto Rs. 2000, or imprisonment which can extend upto 6 months, or imposition of both. For a second offence committed within 3 years of the previous one, the punishment is enhanced to Rs. 3000, or 2 years, or both. Many countries permit mild degrees of intoxication, but beyond a certain statutory BAC, it becomes a culpable offence. For, e.g. the statutory limit is 20 mg% in Poland and Sweden, 50 mg% in Finland, Norway, Netherlands, Yugoslavia, Portugal, and Greece, 80 mg% in Denmark, Germany, Belgium, UK, France, Switzerland, Austria, Italy, and Spain, 100 mg% in Ireland, and 80 to 150 mg% in the different states of the USA. Some countries do not allow even traces of alcohol in the blood of a driver, e.g. Russia, Czechoslovakia, Hungary, Bulgaria, Romania, and Turkey. In India, the statutory limit has been fixed at 30 mg%. But the general practice is to convict only on the basis of a medical examination, i.e. when it is proved that the driver of the vehicle was under the influence. 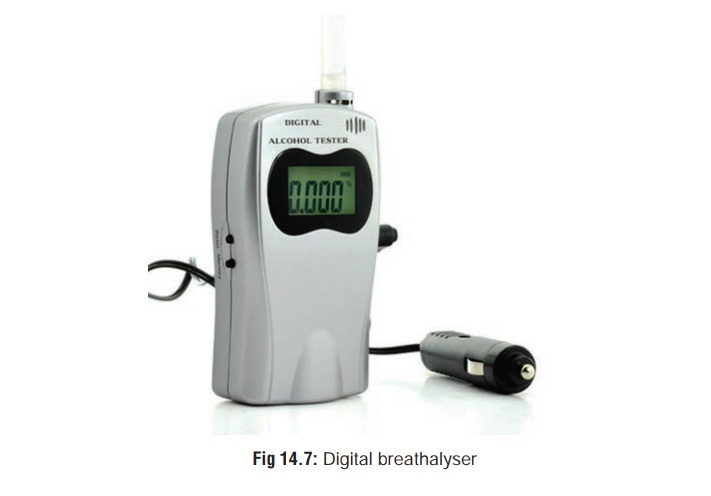 Breathalyser*—In many countries including India, traffic police carry special equipment in the form of breathalysers (Fig 14.7) to detect alcohol in the breath of a suspect driver. It serves as an “on the spot test”. Estimates of BAC based on breath analysis are legally admissible as per S.185 of the Motor Vehicles Act, 1988 (amended 1994). The basic principle underlying a conventional breathalyser involves calculating the weight of alcohol which accompanies 190 mg of CO2 in the subject’s breath. This is converted to BAC using the observations that 1) alveolar air normally contains close to 5.5% (by vol) of CO2 i.e. 190 mg of CO2 in 2100 ml of alveolar air at 34°C, and 2) the weight of alcohol present in 1 ml of blood is equal to that present in 2100 ml of alveolar air. Proper breath sampling is essential to the correct analysis of breath alcohol. For correct sampling the operating procedure is performed so as to obtain what is described as alveolar air or deep-lung breath. This requires the collection of the end portion of a prolonged forced expiration, which is necessary to avoid too much mixing with dead space air, i.e. air that is not totally in equilibrium with the BAC. From numerous experiments conducted it is now well established that there is an excellent corelation between the breath and blood level, and the ratio is generally 2100 : 1. This is based on Henry’s law which states that when a volatile chemical (ethanol) is dissolved in a liquid (blood) and is brought to equilibrium with air (alveolar breath), there is a fixed ratio between the concentration of the volatile compound (ethanol) in air (alveolar breath) and its concentration in the liquid (blood), and the ratio is constant at a given temperature, i.e. in this case 34°C which is the temperature at which the breath usually leaves the mouth. –– A surgeon performing an operation under the influ-ence of alcohol can be prosecuted under S.304-A of the IPC if the patient dies during the course of surgery. The fact that he was drunk at the time of the operation is likely to be considered as strong evidence of rashness. –– A doctor may be sued for damages in the event of the patient suffering damage or death due to his negligent conduct. If he was intoxicated at the time he administered treatment it would only strengthen the evidence against him. –– Patient management under the influence of alcohol will be considered as infamous conduct (profes-sional misconduct), and the doctor is liable to be proceeded against by the State Medical Council. The drunken doctor runs the risk of his name being erased from the medical register.